If you don't love or at least like this movie, you must me crazy. That sounds cliche, but its so true. It's more than a classic, its even more than a landmark film, it's a part of the fabric of American (pop) culture/landscape. The movie has pulled off the trick of being so effortlessly appealing and charming -- yet it never simply coasts on either (though even if it did, it wouldn't matter much). It's so much of everything that I love about movies and about life, but I'll just continue on with my little tid-bits. Also, I will at some point in the near future, doing CineBites for Part II and Part III as well so look out for that. First Bite: Why does it feel so short? It's real strange that a movie that's central focus is "time" seems so short on actual run-time the more I see it. A few months back, when I started getting back "into" the movies and watched all three in a row, I couldn't get over how quickly the first movie flew by. It's maddening in a way, because I love relishing in the atmosphere of the movie and it's frustrating when its running right by and I want to enjoy and savor every moment of it. It's paced beautifully -- sleek and elegant -- and I can't blame the light, brisk flow because that's just another refrehsing aspect of it. I always usually count the third act as starting when Marty explains to George what the plan for the dance is, as they hang up laundry, and I always think, "wow, we got here fast!". Maybe it's just that the narrative is so concise and tightly strcutured (without any fluff) that everything gets said in done in way that gets right to the point. What's even more odd is that this is the second longest of the three films, with Part III having two more minutes, and Part II feels the longest but is really the shortest. --- ??? Crazy...but I will say that the short-feel of the original is not a flaw at all (and is more satisfying if watched back to back with Part II). Second Bite: Claudia Wells as Jennifer Parker. "How 'bout a ride mister?" Third Bite: More than simple popcorn entertainment? In the eyes of many, the first film alone is a brilliant, landmark movie that's been a treasured part of many lives for years and years, and one that many feel deserves to be taken seriously for more than just a cool piece of pop culture. 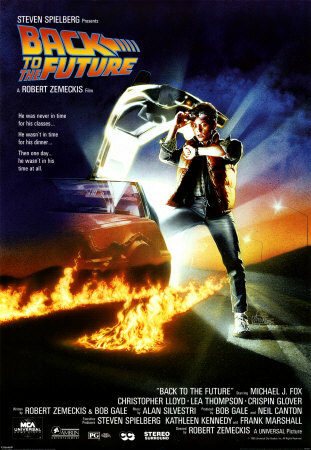 Some might see it as simply enjoyable fluff, but I'm in the minority that it should be accepted within a serious film canon (along with The Godfather or Citizen Kane -- both of which are actually quite overrated and on a lesser tier than BTTF. Yeah, I said it). 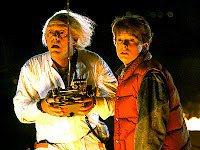 The lightness of Back to The Future shouldn't keep it from a higher status, as many other light comedies are held in higher regard (with some not so deserving), and especially considering that the film reaches and touches people on a universal level says alot, and considering that it is actually more than lightweight fun. Some might disagree with me here and say it has found its official place, but I'm not certain yet. Fourth Bite: Stoltz (almost) as McFly. What further elevates the movie is the charming, magical, joyful scoring done by Alan Silvestri, matched with the awesome songs like Huey Lewis (And The News) songs, The Power Of Love and Back In Time, Earth Angel, Roll with me Henry, etc. First with the score, it's just so (again, for the tenth time) appealing, with feeling and a sweet but powerful emotional hook. Whether it's Marty entering 1955, or Biff about to break George's arm, or Marty escaping from Biff's gang on a hover-skateboard while Lorraine and others watch in awe, the score is always right up to par, beat by beat. The Huey Lewis songs are so iconic now and both add a kind of flavor and energy to the film, as well as bookending it. They don't feel dated at all, really. One begins the film on a energy high note, and the other does the same for our exit as the DeLorean comes flying at us and into 2015. Among other 50s classics that further immerse us into 1955, Roll we me Henry is a fun counterpart to the elated sodashop scene and of course, the beautiful Earth Angel. Helping to further escalate the climatic moment and ending on a joyus and elated note, it always gives me the goosebumps; with George sealing the deal with Lorraine and Marty (and his hand) staying in time. Of course, I have many more thoughts and things to say about the movie, but that might come in a review somewhere down the line, so I'll leave it at this. But, remember to look out for CineBites on the sequels!